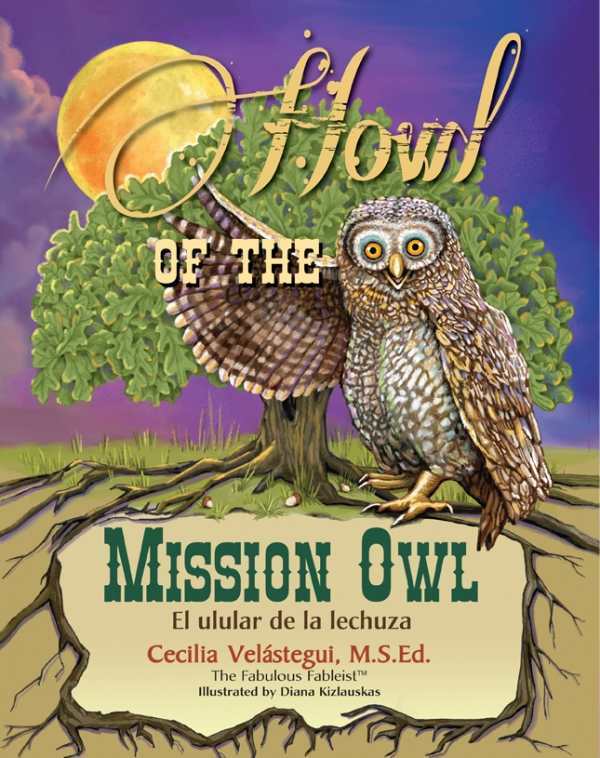 Howl of the Mission Owl: El ulular de la lechuza, with its seamless inclusion of Latin culture and language, is a must for libraries and classrooms. Full-page color illustrations by Diana Kizlauskas are both accurate and whimsical. Native plants, animals, and people are depicted in great detail, softened by rainbow sunsets and bright full moons reflecting off the coastal waters of the Pacific Ocean and the high Sierra Nevada mountain peaks. The presence in the story of the sailing brig Pilgrim indicates that the animals’ adventures occur sometime between 1825 and 1856, at the height of gold rush fever. Velástegui includes references to native peoples such as the Pomo and Mono tribes, as well as the Californios; local missions such as San Luis Obispo and San Juan Capistrano; and quotes and facts introducing Cervantes and his character Don Quixote de la Mancha, who is another source of inspiration. There is some repetition when introducing the animals, notable only because the book’s accuracy and attention to detail is otherwise flawless. The California grizzly bear, California spotted owl, California condor, and even the colorful California poppies are correctly-named species and subspecies native to the land. However, the “California gray wolf” and “California humpback whale” are not, and the use of “California” as an adjective seems overdone in the opening pages. Howl of the Mission Owl: El ulular de la lechuza is a must for libraries and classrooms, reminiscent of My Colors, My World: Mis colores, mi mundo for its seamless inclusion of Latin culture and language. It would be an appropriate choice for middle and elementary school kids. The quality and quantity of facts leave the door wide open for further study, exploration, and discussion. It is not necessary to be bilingual to enjoy this brightly illustrated fable at face value.